Big THANK YOU to the Cohort 3 Mentors for continuously supporting their trainees during the past nine months! The street doulas goal was to paint a Mural that portrays the connection between Mother Earth and the womb. They aimed to celebrate and empower our community through a mural project that will bring our different cultures into one. Join us in a celebration of Cohort 3 for their completion of the nine month Birth & Postpartum Doula Program! This will be a great networking opportunity for people interested in knowing more about Hatch and also to meet local community members, doulas, and birthworkers! Great turnout from the community in participating in the Hatch Street Doula Community Mural Project! Trainees had a great experience learning from guest speaker Michelle, the Education Manager from Inner City Advisors. They learned about financial empowerment and got help in launching their own doula businesses! Join us for our monthly community meeting! Wednesday May 16th, 2018 5:30-7:15pm. Dinner will be served at 5:30. Childcare will be provided! For this month’s community meeting, we will have guest speakers Michelle and Caron will speak to us about how to start your own doula business while maintaining wellness. Michelle and Caron are from a local company called Inner City Advisors and their focus is on engagement, education, and advising. Inner City Advisors has been impacting the community since 1996 and has worked with thousands of businesses and created thousands of good jobs. Join the Hatch Street Doulas in their Community Project. At this event, volunteers will participate in a community project of painting a mural with the Hatch Street Doulas. Their goal is to paint a mural that portrays the Earth as a womb and represents the transformation of generations. They want to celebrate and empower our community through a mural project that will bring our different cultures into one. 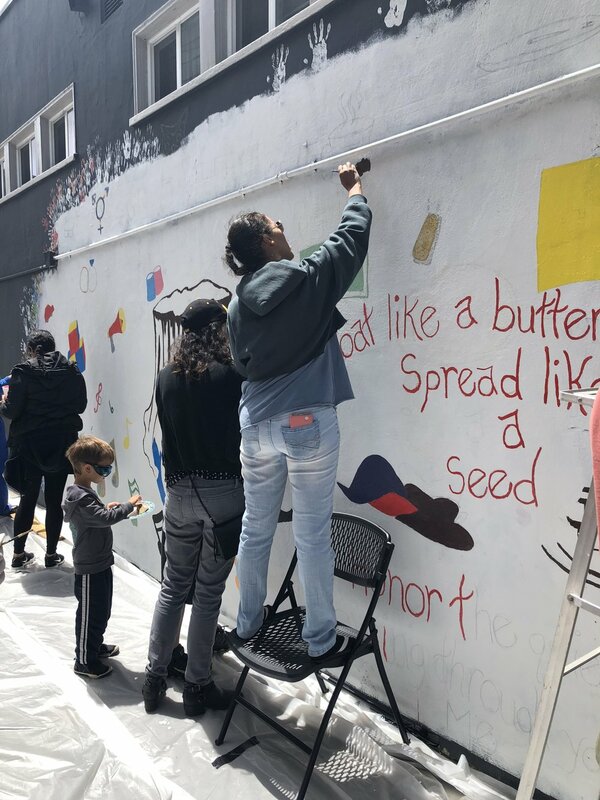 Our Street Doulas have been working hard for the past four months on this community mural project, which will be created at this event and would love for you to join! Following the mural painting will be a Community Baby Shower from 4-5pm. There will be a raffle of baby and parenting supplies such as toys, books, clothes, diapers, bottles, wipes, furniture, and more! Food and drink will be available. There will be local birth workers, midwives, and doulas, to talk and ask questions. Our street doulas mission is to offer peer education and outreach to their community, linking individuals, families and communities to resources and helping them to step into their own power: to find their way, their voice and their strength. Our street doulas have been brainstorming ideas for a way to demonstrate an example of community involvement and inspire participants and bystanders to continue to reach and pursue their goals. They have been working sensibly for the past four months on this community project, which will be created later this month. At the meeting, they will present about themselves, how Hatch has impacted them, their reason behind their mural project, as well as invite interested individuals to participate on the creation of their mural. Dinner is served from 5:30-6:00pm. Childcare will be provided. Come Join us!! Please RSVP for address to kat@thehatchcommunity.org or text 510 250 5883. "My second prenatal meeting with my second client was the best one yet. It was the first meeting that I got to demonstrate comfort measures that I learned months ago. The client was very excited and ready to go. The first thing we did after going over her birth plan, was go over the comfort measures using the rebozo. She enjoyed the rebozo over other comfort measures I demonstrated with my hands alone. The second thing we went over were the contents of my doula bag. She especially enjoyed the fact that chapstick was included inside. I understand that a birthing parents mouth may become chapped in the process. Having gone over these items and positions BEFORE going to the hospital really helps the client and I have a better understanding of what they need from me and what i can potentially expect from them. In addition to the birthing plan my client and I formulated, we also reviewed what my role is as a doula when labor begins. She and I are very prepared for the new little one and I am very excited for my first birth." "I started the Doula program through Hatch in September 2017. 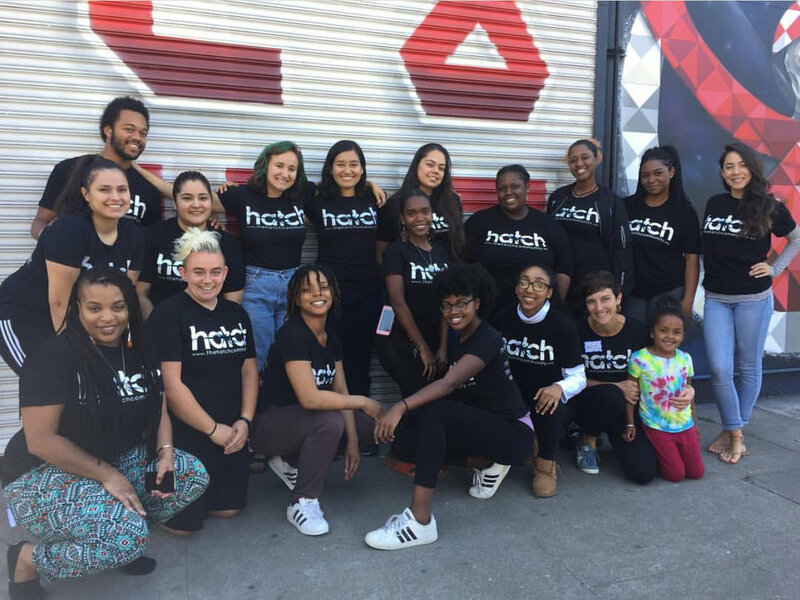 Working with Hatch and the community has been a wonderful experience for me there’s a lot of people that come in to teach hands on activities to us young Doulas in training. My experience with Hatch has been one of the greatest, to actually be able to help out our young parents and take this beautiful journey towards parenthood with them has hands down been memorizing. I started working with Hatch because it is a learn as you go. I really like how they are there every step of the way to help us young doulas in training be the best that we can be. One of my greatest appreciation of Hatch is having our mentors whenever we need them, they’re just a text, call, or email away from a check in or a bit of advice. I’m glad to have the greatest mentors thank you Nicole and Chantal for the support." "It is not uncommon for majority of people to not know what a doula is. A doula's work is completely outside of mainstream culture and society. A doula works to empower, inform, and support a birth parents journey into caring for a new life. In a heteropatriarchial society that works to isolate women from one another, to devalue emotional labor, and profitize pregnancy, being a doula is a radical form of a revolution. The historical origins to the term doula are understood to be greek, meaning "women who serves." In other translations it can be understood as "female slave." While neither are necessarily empowering definitions to the term, reappropriating the term wasn't until the 1960's within the United States when studies began showing that having a doula, or a support person, reduced needs for medical intervention. Today, a doula is seen as privilege for the white and wealthy. In many ways, this is true based off socioeconomic status of different populations within the United States. However, doula's, midwives, and healers are indigenious to every ethnic group within history. As a HATCH doula we aim to change this notion that people of color and low-income people are undeserving of aid. Since my time at HATCH I have realized the importance of working with community to support one another through new transitions, and this is not just for the rich. Young parents need to feel loved in order for their children to feel loved, and that is what a doula is ultimately, a provider of stable support and love." Hatch Community Meeting: March 21st! Jetaun’s mission is to awaken love, kindness, justice and forgiveness within the human family. In 2009, desiring to exhale her mourning due to her inability to naturally bear children she created, produced, and performed in the one-woman dance monologue “Invisible Womb.” Passionate in the belief that dance can bring healing to the body, mind, and spirit, she received her B.S. in Kinesiology and Dance and her M.A. in Holistic Counseling with an emphasis on Somatic Psychology. She is currently in private practice as a Marriage and Family Therapist with Conscious Voices: African-American Well Being Center and is the Executive Director of Serenity House, a residential recovery and well-being program for women. Come and join the Hatch Community in learning about Self Care with Jetaun Mills! Dinner is served at 5:30pm. Childcare will be provided. Attendance is FREE and all are welcome! Space is limited RSVP to reserve a spot. How Will Nuturing Touch Apply to our Doula Trainees? They will bring these newly learned skills into the community, working one-on-one with new families and teaching groups. As we support parents with these early engagements with baby, we are laying the foundation for a more resilient, brighter future. Nurturing Touch is an ideal way to build a strong, trusting, and loving foundation between children and their parents..
Pictured: Maile (Hatch Birth & Postpartum Doula Trainee) and her client Cy'maya's son, De'ronne Jr.
Come and join the Hatch Community in learning about Nuturing Touch. Nuturing touch is an ideal way to build a strong, trusting, and loving foundation between babies and parents. In nurturing touch, the cues of the infant are understood, listened to, and responded to so that it strengthens the baby parent bond and builds emotional intelligence; essential for a lifelong of healthy relationships, sense of self, and learning. 2018 Hatch Nuturing Touch Training! Hatch is currently recruiting for people interested in learning about nurturing touch. The commitment is the training four days of training in February. Participants will learn and present their skills to the community. Once completing the full required trainings, you will be a Hatch Certified Nurturing Touch Doula. Please join us for... Hatch’s Community Meeting! Immediate Postpartum Healing and Support by: Gingi Allen - owner of the Art of Mothering, Birth & Postpartum Doula, Certified Professional Midwife, Licensed Midwife. The Immediate Postpartum Care meeting will present information about the first Golden Hours of Bonding after birth and then the first couple weeks (bedrest, nourishing foods, holding/bonding with baby, yoni & body care) postpartum. Gingi will also speak about how certain cultures have very serious practices around postpartum and how important it is to respect cultural ways of doing things. Mostly everything that will be presented will be financially accessible. Dinner is served at 5:30pm. Childcare will be provided. Attendance is FREE and all are welcome!